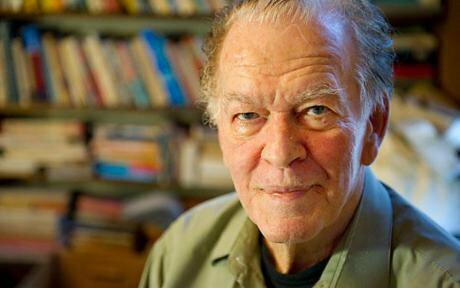 Image: Gene Sharp, who died this week aged 90. I first came across Gene Sharp in 2006. An enthusiastic and internationally minded student activist, I had been considering writing my Politics undergraduate dissertation on voting behaviour in student elections. That was until I found a copy of Sharp’s 1973 work The Politics of Non-Violent Action in the university library. I opened it, read it, and a new world of possibilities was revealed. Here was a sophisticated theory of how mass movements of civic society can and do dismantle the world’s most authoritarian power structures, beginning with the simple recognition that all elite power is derived from the co-operation of the ruled. I changed my mind about my study interests, and instead began an investigation into democracy movements in Sub-Saharan Africa in the wake of the Cold War. Beginning with Gene Sharp’s theories, I wanted to know whether violent or non-violent struggle had been more likely to sustain democratic outcomes in the long term. Cognisant of a multiplicity of factors involved, non-violent conflict nevertheless won out. With trepidation I looked up Gene Sharp’s email and sent him the final version. To my surprise, within a couple days I had an encouraging reply. I was spurred on to further study and became interested in whether the theories could be mapped on to other historic campaigns for justice. Again with his encouragement, that became my first book. After it was published, we met for a morning, at his little home-based office in Boston. It was the time of the Occupy movement and I’d been visiting encampments, writing about the people I met. Did he think his theories would work against the corporate 1% I asked? “I don’t know” was his honest reply, “but I hope your generation will find out.” Then he reached – pharmacist like – for a couple of his out-of-print books. “And I hope that these will help”. The strategies of war are ancient – as any visit to museum will show. But while non-violent methods of fighting back can be found far in to history too, consciously non-violent strategic action for change remains a comparatively new field of study, within which is a breakthrough regarding the potential for peaceful protest. Democracy campaigners all over the world have studied Sharp’s work and on occasion used it to successfully bring down dictators, changing millions of lives. Who knows how many more lives those ideas might have saved as revolutionaries opted for strategic nonviolent action over civil war? He himself though was always modest about his achievements, as well as cautious about claiming change-processes as complete. In recognition of his nearly sixty years of writing, the newspaper testimonials rightly name Sharp as one of the foremost systematic theorists of non-violent struggle of the twentieth and twenty-first centuries. But there is something else to add, borne witness to by the Twitter messages flowing in from people all around the world. Gene Sharp may not have had significant resources, but right in to his eighties he made the choice to make time for people. Instead of training or instructing them, he simply believed that with aid of self-study and strategic analysis, movements for democracy would find the best routes to change in their context. With the passing of Gene Sharp this week, the world has not simply lost a great mind, but a generous soul as well. Read openDemocracy's interview with Gene Sharp from 2012 here.